As Easter approaches and we travel through the season of Lent we become aware of the the journey that Jesus faced on His way to the cross. 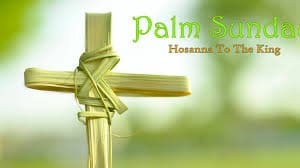 Palm Sunday is a time when we reflect on the arrival of Jesus into the city of Jerusalem. What a time of excitement and celebration. Mark 21:9 says “And the crowds that went before him and that followed him were shouting, “Hosanna to the Son of David! Blessed is he who comes in the name of the Lord! Hosanna in the highest!” Imagine the crowd that would, within days, turn so angry and filled with hate. Join us this Sunday as we explore Isaiah 53 and John 19:12-37 with Peter Bloom, “The Death of Jesus: it was for you and for me”.